I had a block of extra-firm tofu in my fridge, which I was originally going to try baking. But then I came across an eggless “egg salad” recipe using tofu and I decided to try something like that instead. It’s not that I don’t like regular egg salad–I really love it–but I do have high cholesterol, so I try to be careful with my egg intake. This tofu egg salad has a similar consistency to regular egg salad and the spices added to it give it a great flavor. I really liked it and it’s nice having an eggless egg salad option if you need it! Drain tofu well, then press and squeeze the tofu, draining any additional moisture from it. In large bowl, crumble the tofu, then add the diced celery and green onion, blending ingredients together. In small bowl, combine the mayonnaise, mustard, curry powder, turmeric, and parsley flakes, blending well. Add this mixture to the tofu mixture in the large bowl, stirring well to combine. If you’d like the mixture to be creamier, add a little more mayonnaise–a Tablespoon or two–and season with salt and pepper. Serve as a sandwich or put a large scoop over some mixed greens for a salad. Have you made anything like this before? I thought the tofu worked out great in this recipe. I’ll have to try baking it sometime, too. What’s your favorite way to fix tofu? Linked to Inspire Me Monday, Wow Me Wednesday, Full Plate Thursday, Let’s Get Real Friday. This entry was posted in Food and Recipes, Healthy Eating, Salads and Dressings, Sandwiches and tagged curry powder, egg salad, eggless egg salad, tofu, turmeric, vegan mayonnaise on April 18, 2015 by nancyc. That looks just like egg salad. Never thought of using tofu like that. I love it fried or grilled it’s wonderful. I’ll have to try your egg salad. What a fantastic idea Nancy! As you know, I can’t eat eggs and I crave them on many occasions. Woo hoo now I can have an eggless egg sammie! 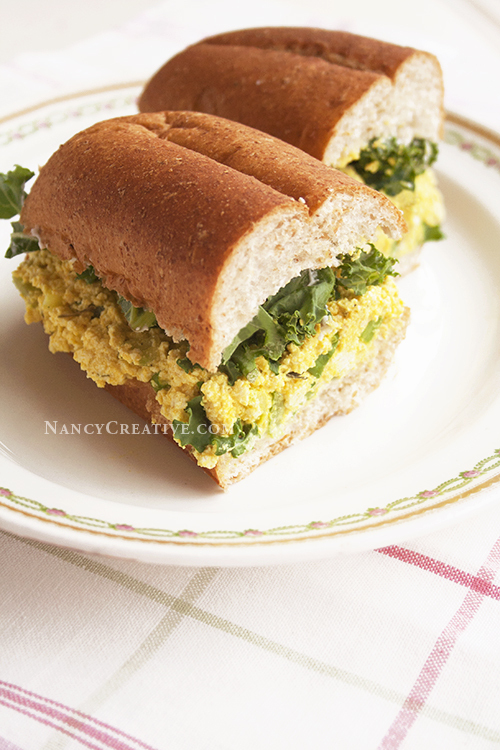 Eggless egg salad – thatz interesting dish Nancy… love using tofu in there. … looks yummm…. It certainly looks worth a try! Yes, I liked it better than I thought I would! I couldn’t tell if my comment went thru on your site, but the waffle sundaes look so yummy!